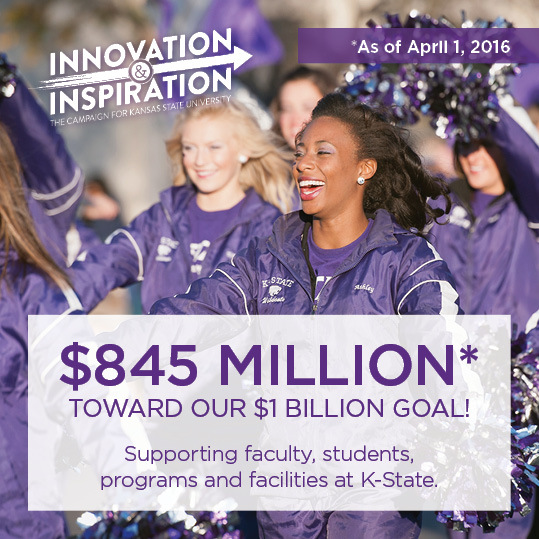 As of April 1, 2016, fundraising for the Innovation and Inspiration Campaign for K-State topped $845 million, moving us closer to our $1 billion goal for the Innovation and Inspiration Campaign and realizing K-State’s 2025 visionary plan. In fact, just 72 percent of the way into the the campaign, we are 85 percent to goal! Later this spring, we’ll have even more occasion to celebrate this dynamic campaign: The Innovation and Inspiration Campaign is coming to Denver, Dallas and Fort Worth. Join your K-State family for a special evening with K-State leaders and students, learn more about the campaign and how you can make a difference at K-State. If you have questions, please contact Chris Spooner, associate vice president of campaign and central development, at 785-532-7697 or chriss@found.ksu.edu.